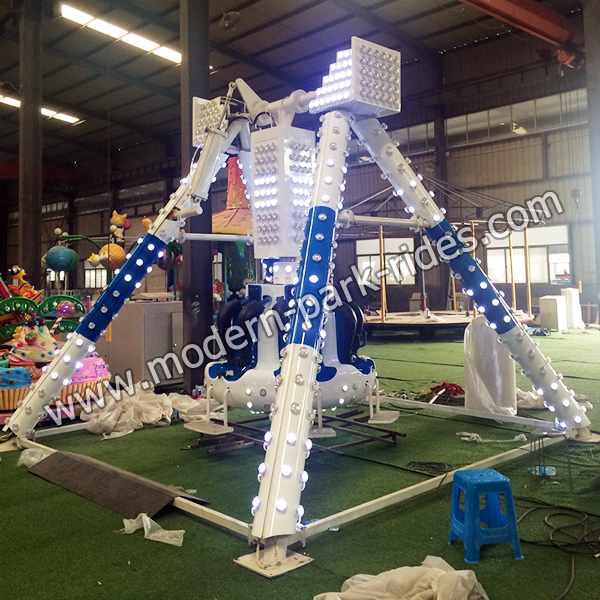 The mini frisbee ride, also called small/mini pendulum ride, is the scaled-down model of the frisbee ride for adults and mainly suitable for many children as well as the young people. The rides are equipped with the circular gondola and the circular gondola rotates as it swings back and forth. The circular gondola can bob up and down to 90 or 120 degree, sometimes, even 360 degree. Riders on the mini pendulum ride which is in high speed rotary pendulum swings on reciprocating, can not help out with laughter exclaimed and have a strong centrifugal feeling. Sometimes, riders can have the feeling of weightlessness. The mini pendulum ride is truly a popular funfair rides and welcomed by many visitors in the parks.